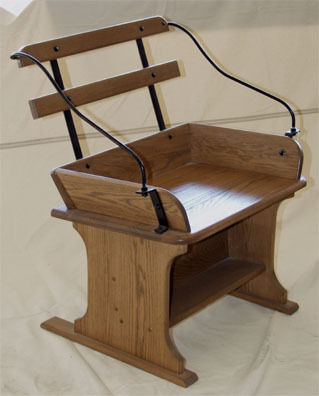 Sure to be the center of attention, this solid oak Amish crafted wagon seat chair is sure to be the perfect addition for anyone that wants to add a bit of nostalgia to their home. Very similar to the seats you would find on an Amish buggy or horse-drawn wagon, this seat is made almost entirely of hardwood except for the steel arms and supports, and is certain to quickly become a family heirloom that is handed down for generations. You will also find a handy shelf at the bottom, which serves a dual function of adding storage and additional strength. We also have another version of this chair that is about twice as wide and supported by leaf springs so that it allows you to lean back and rock a bit.